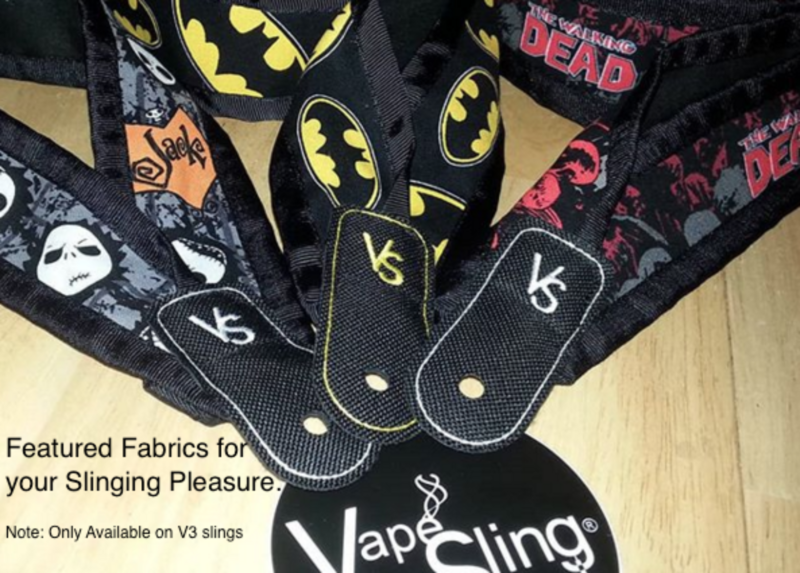 VapeSling® - SlingGuide: Custom or Standard Sling, This guide will help. This guide is link driven to further assist. Click on any link text or where you see to click here—->. A. Version describes the construction of your Sling. C. ADD TO CART: Before continuing to Step 2, select the fabric/cord color at the top section of the product, and click “Add to Cart”. V3 requires a size for neck and body slings. Customize Color: Skip to step 3 if you want a Standard Cradle (Light Silver) on your Slings. Customize your V2.1 or V3 Cradle with Color. Single Color: Once you add theBoundary stitching option to your cart, you may skip to step 3 if only choosing one color for all (VS and outer lines same color) cradle stitching. Add to Cart after choosing stitch color. Example: Choose green stitch for the Boundary color. Click “Add to Cart”. Checkout, will result in a single color green Boundary and VS Logo for your cradle color. Dual Color: For a 2nd color to be used on the VS logo embroidery, click here—-> VS embroidery. Please make sure you click “Add to Cart” Before continuing to Step 3. NOTE: New Send & Sling™ (only available for V3 slings) Customize is also available. Now you can personalize your V3 Sling type with any fabric print you have. Send in your fabric choice to Sling your Sports teams, car/bike brands, TV show (TWD, Game of Thrones, etc), or a favorite pattern print. Skip to step 4 if you only want a Standard Tight Cradle on all your Slings. This is a free option provided for vapers to decide which aperture size is best suited for their use. If you want this option, Please make sure you click “Add to Cart” Before continuing to Step 4. We recommend repeating custom choices for each sling Version/type in a consecutive manner. This will avoid confusion by both you, our customer and VSLLC processing staff. If you have an Ego atty to use with your sling, we offer the 510toEgo adapter and Beauty Ring. The 510toEgo adapter also guarantees 100% connection. Yes, it’s guaranteed. There are few atty’s and batty’s without adjustment pins. This 510toEgo adapter will guarantee any 510 or Ego atty to connect when using any VapeSling.